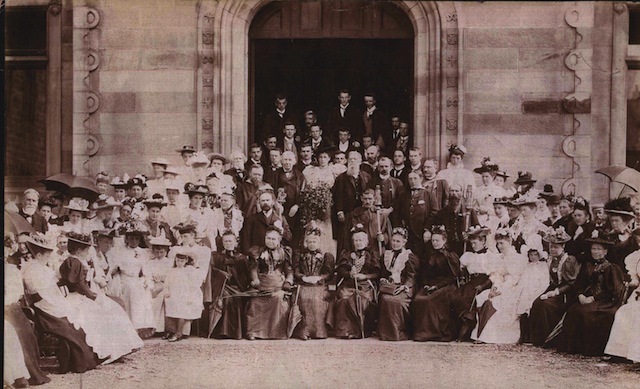 While the prominent position of St Andrews in the development and early history of photography is now widely acknowledged, the town’s role in early film history has not previously been recognised. 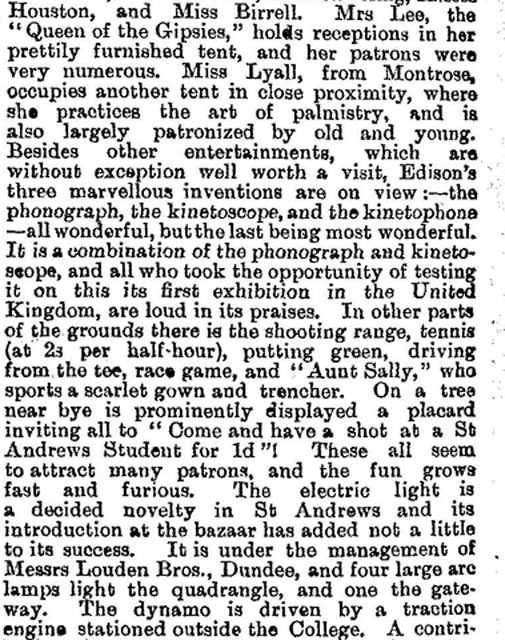 Yet, new research suggests that Thomas Edison’s Kinetophone made its UK debut at this University event. This represented not only the first appearance of the moving image within St Andrews, but also the first appearance of what we might understand today as ‘sound film’ within the United Kingdom. However, the Kinetophone would prove to be a very short-lived and unprofitable technology. By the summer of 1895, no new Kinetophones were produced. 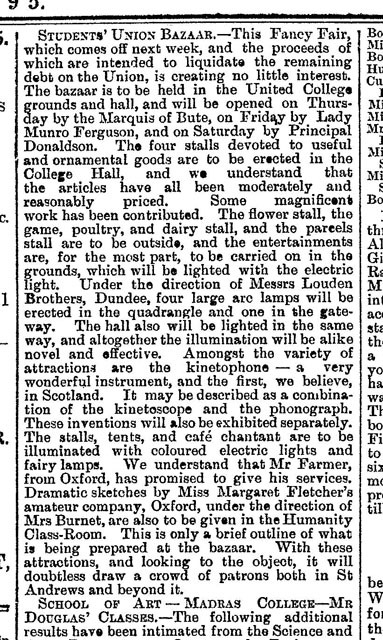 There were sporadic appearances afterwards, for example in Dundee and Edinburgh in December 1895. 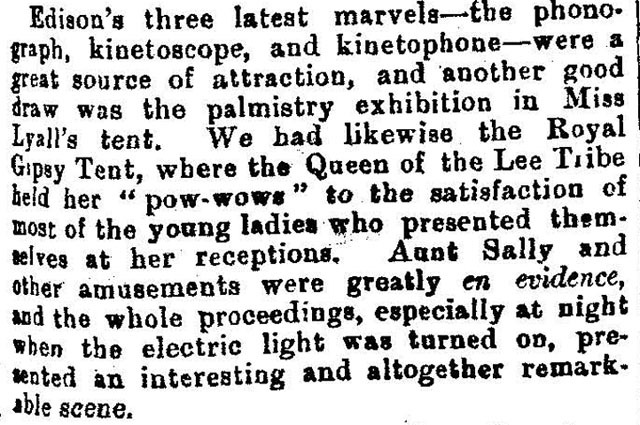 At Edinburgh, the films shown on the Kinetophone included Edison’s Highland Dance and ‘a “Trilby” Burlesque dance to the accompaniment of music’. The Kinetophone made no attempt to synchronise the sound to the image, but rather provided musical accompaniment to the flickering images. The Kinetoscope had enjoyed a longer history. 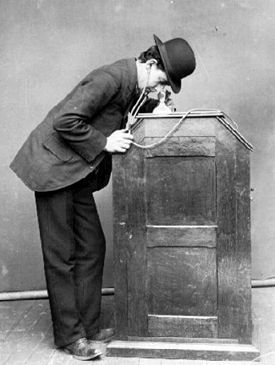 First unveiled in 1891, it was not only shown at fairs and scientific events, but also within ‘Kinetoscope parlors’. The first parlor, housing ten Kinetoscopes, opened in New York in April 1894, with further venues following in Chicago and San Francisco within the next six weeks. A parlor opened on Old Broad Street in London in August 1894 and in Oxford Street in October. A number of the early films for this device still survive today, including Sandow, Carmencita and Boxing Cats. These films, which borrow heavily from vaudeville, emphasise movement, display bodies in motion and from the outset presented the opportunity for men and, in particular, women to ‘safely’ view forbidden subjects. 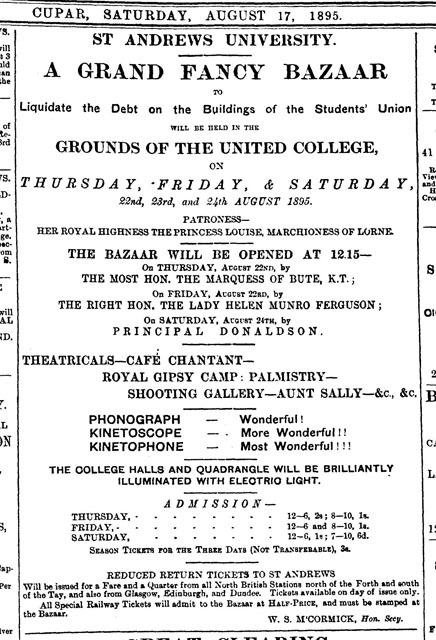 It is likely that a selection of these films would have been available to those attending the University Bazaar in August 1895.